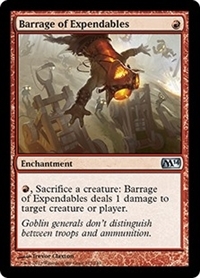 R, Sacrifice a creature: Barrage of Expendables deals 1 damage to any target. 7/1/2013 Barrage of Expendables deals the damage, not the sacrificed creature. Notably, that creature having deathtouch or lifelink provides no additional benefit. 7/1/2013 Because targets are chosen before costs are paid, it is possible to choose a creature as the target of the ability and then sacrifice that creature. The ability won’t resolve when it tries to resolve and no damage will be dealt.